Have you ever participated in a CSA? CSA is Community-Supported Agriculture, and you pay for a regular share. 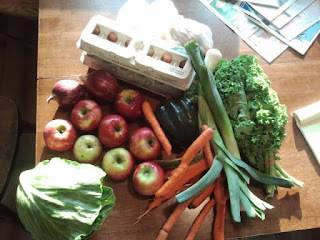 Usually CSAs are a summertime thing, but once before and now again I am participating in a Winter Share. Last time the share was once a month for three months, which was actually a little complicated. 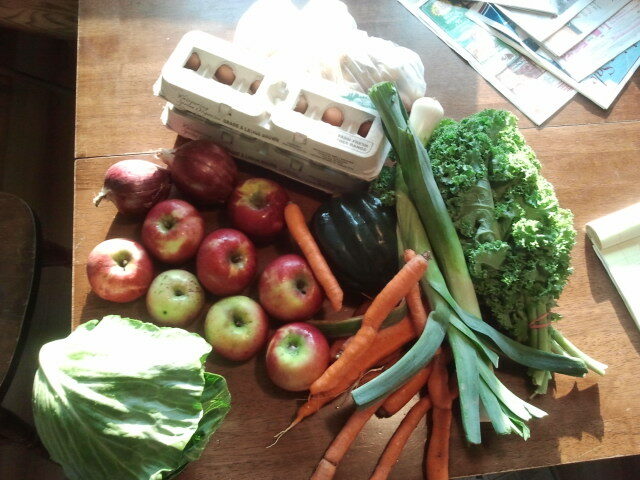 Too much produce to be eaten over the course of a month. This time I'm doing a 10-week Winter Share, which works for me (summer is a little too complicated with all our time spent at camp), and we're in the third or fourth week of the season. In addition to the vegetables, we're getting 2 dozen eggs each week. I think I may have over-estimated our egg usage, but I'm finding ways to use them up. I've been able to use almost everything we get, including an enormous butternut squash and a pie pumpkin, which I roasted, mashed, and froze for future use. 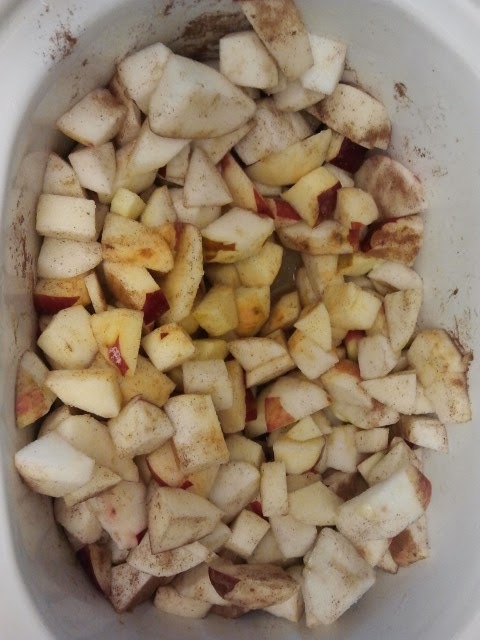 Peel and cut up a bunch of apples. Don't stress too much about the peels, a little bit of peel makes for nice color. Add in some water, I used about a cup. Add a little lemon juice, a bit of cinnamon and allspice, and I did put some sugar in but you could use honey or no sweetener at all. Cook on low for a while...4-6 hours was good. 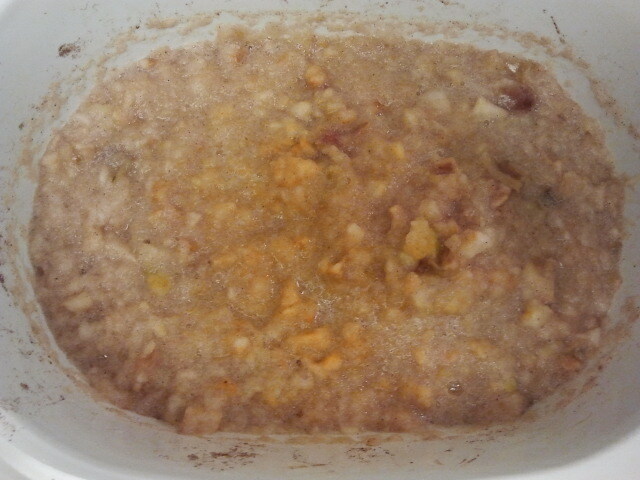 Then I mashed it up with a potato masher. I like it chunky, so I didn't worry too much about how fine it was. A third went into the freezer, a third went into the fridge for eating, and a third went to a friend. How are you enjoying the fruits of the season? P.S. Welcome to November...it's NaBloPoMo, National Blog Posting Month. As I've done for the previous few years, I'll be blogging every day during the month of November...join me! 1. I make challah every week, that's 6 eggs right there for my 2 loaves. 2. Breakfast around here most often is what we call "eggies and rice". Leftover cooked rice heated up in a frying pan with a bit of butter. Crack 1 egg per person, plus 1 for the pan over that and stir like crazy until the eggs are cooked. Plate it up. I've yet to meet a person who doesn't love it.